Think a lack of fur makes hairless cats low maintenance? That’s not the case. 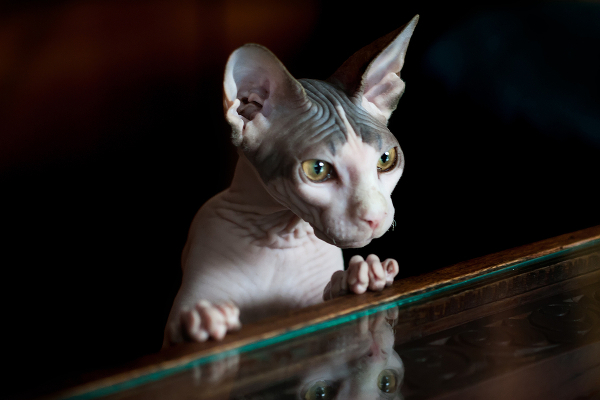 Hairless cats need regular care and attention to keep their skin in tip-top shape. 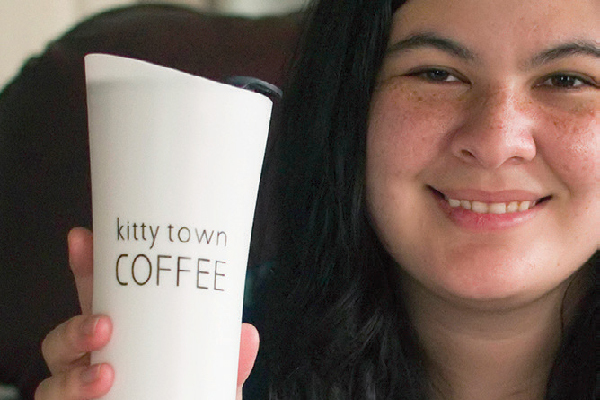 Love cats, but hate cat hair? If you have a hairless cat breed like a Sphynx or Peterbald, you don’t have to worry about brushing your cat or lint-rolling cat hair off everything you own. Score! Some people think that hairless cat breeds don’t need any grooming at all, but the truth is, hairless cats require the same nail trimming and ear cleaning as other cats. Also, even though most cats with hair only need occasional baths, hairless cat breeds require frequent bathing. Why do you need to bathe hairless cats regularly? Hairless cats don’t mean low-maintenance cats! Photography by Shootdiem / Shutterstock. Some hairless cats do have a little bit of hair, mostly on the face, ears, nose and toes, and some hairless cats even have a fine peach fuzz on the body. But this tiny bit of hair doesn’t do much to soak up the oils on the skin. To bathe your hairless cat, use warm (not hot) water and suds her up thoroughly with the gentle shampoo. Be sure to rinse all of the shampoo off the body or it could irritate the skin. While your cat is still in the tub or sink, wipe the ears out with cotton balls and a gentle, cat-safe ear cleaner. This is an important step because, like the skin, a hairless cat’s ears can become very greasy and dirty. Once your cat is clean and rinsed, pat the skin dry with a soft, fluffy towel, making sure she is completely dry before releasing her back into the house (you don’t want her to get cold!). If you are concerned that your hairless cat’s skin is too dry, talk to your vet about the safest ways to keep the skin moisturized. And if you notice that the skin looks red, has lesions or is flaky, make an appointment to see the vet without delay. One other note about skincare for hairless cats: the less hair a cat has, the more prone she is to sunburn. If your cat spends a lot of time sunbathing in front of the window, you might want to consider limiting her sun exposure. All cats need their nails trimmed regularly, but trimming a hairless cat’s nails is an especially vital task because when a hairless cat scratches herself, she can damage her sensitive skin. Do hairless cats need to wear clothes? 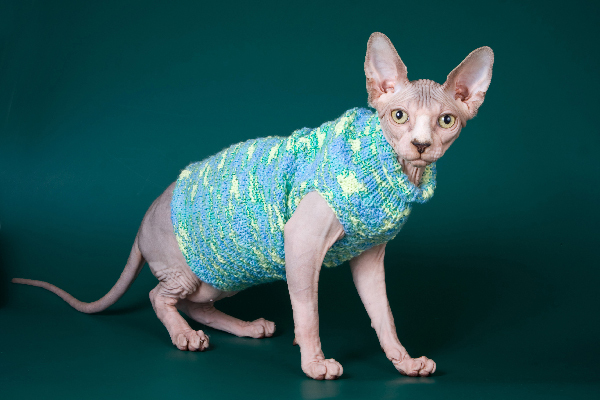 Some hairless cat owners use shirts or sweaters to keep their hairless cats warm. If you do this, be sure to regularly wash your cat’s clothes (they will get greasy!). To protect your cat’s delicate skin, use a hypoallergenic laundry detergent that’s free of dyes and scents. Thumbnail: Photography © Dixi_ | iStock / Getty Images Plus. What price range for hairless cat do they go in to heat l juxtaposed want a pet!!!!! !